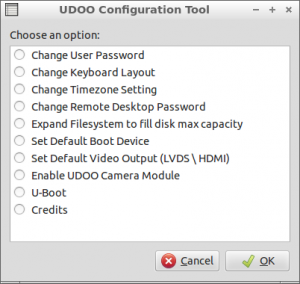 UDOO Configuration Tool is a utility created to assist UDOO basic and advanced Configuration. It comes preinstalled on UDOOBuntu Official UDOO Operating system. This allows to enable UDOO LVDS Panel, 7 or 15 inches. A reboot is required to enable them.